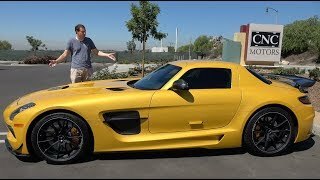 Mercedes-AMG revealed the much anticipated high-end super sports car version of the gull-wing model, the 2014 SLS AMG Black Series, which will go on sale in United States in summer 2013. Inspired by the SLS AMG GT3 racing version, the fifth Black Series model from Mercedes-AMG boasts a fascinating mix of breath-taking design, outstanding driving dynamics and uncompromising lightweight construction. With a DIN kerb weight of 1550 kilograms, the SLS AMG Black Series achieves a power/weight ratio of 2.45 kg/hp. 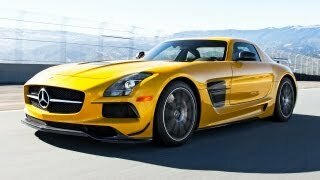 The 2014 SLS AMG Black Series is powered by the AMG 6.3-litre V8 engine which generates a power output of 464 kW (631 hp) at 7400 rpm and is mated to an AMG SPEEDSHIFT DCT 7-speed sports transmission. The most dynamic gull-wing model of all time accelerates to 100 km/h in 3.6 seconds with a top speed of 315 km/h.